I’m Ed Smith, a Sacramento Workers’ Compensation Attorney. Various rules and regulations have been developed under California law to protect the rights of construction workers who may be injured at a construction site. I can be reached for free, friendly advice at 916.921.6400. Learn more about your rights by reading the information that follows. A general contractor’s employee is prohibited under the Workers’ Compensation law from suing their employer, provided the employer has workers’ compensation insurance. Their sole remedy is to claim workers’ compensation benefits. This is called the ‘Exclusive Remedy’ doctrine where an employee is not permitted to sue their employer for negligence, barring very few exceptions. The stellar aspect about this doctrine is that it follows a ‘no fault’ system. Therefore, an injured worker has to only prove injury in the workplace, and not prove fault in order to recover benefits. The downside is that the construction workers (who are usually are high wage earners) will only receive a fraction of their earnings in workers’ compensation benefits. They cannot recover damages for suffering, pain, and emotional distress under the workers’ compensation law. In the context of a construction accident, a worker employed with an owner of a construction site also cannot sue the employer for the same reasons as that of a general contractor’s employee. The ‘Exclusive Remedy’ doctrine applies in their case as well. When is the contractor’s or owner’s negligence actionable? Workers employed with a general contractor can sue a construction site owner if they can prove actionable negligence on the owner’s part. Similarly, the workers employed with a site owner can sue a general contractor if they can prove actionable negligence of the general contractor’s part. Apart from the workers’ compensation issues, the general contractor and the construction site owner owe a duty of ordinary care to prevent workplace injuries even in a hazardous work situation. An owner or a general contractor’s liability cannot be solely based on their failure to provide a warning to the workers of a dangerous situation that was, or ought to have been, obvious to a worker. However, the owner or the general contractor could be liable for any failure to correct a dangerous situation, if they knew or should have known about it during their exercise of ordinary care, despite the obviousness of such danger to the workers on the construction site. The general contractor or the site owner may not be bound by duty to warn of the existence of an obvious danger, but may still be bound by the duty to correct it in specific situations. The extent of the duty of ordinary care of an owner at a construction site may be reduced if the owner has passed on total supervision and control to a sub-contractor. A general contractor or a construction site owner’s failure to fulfill a particular duty related to the workers’ safety imposed by regulation, local ordinance, or statute may constitute the basis for liability against them. Duties imposed on a contractor by a statue are often “non-delegable.” In other words, the liability of the general contractor towards an injured construction worker remains in place even if they have delegated or handed over the work responsibility or certain aspects of workplace safety to a sub-contractor. It is not uncommon in construction projects for general contractors to turn over almost the entire control of one or more aspects of the project to independent sub-contractors. However, according to law, a contractor’s responsibility for construction site safety remains in place to follow regulations and statutes. Plaintiffs are now permitted to introduce evidence in cases of personal injury related to safety provisions of the Labor Code. This has made safety regulations under CAL/OSHA admissible into evidence. In rare situations where a construction worker can sue an employer, such as when a dual employment situation is established or when the employer does not have workers’ compensation insurance, it is possible to enter CAL/OSHA violations into evidence during trial or to bolster one’s case during negotiations for a favorable settlement. Apart from the local and state regulations and statutes, a plaintiff in a construction injury case must obtain the actual contracts made between the general contractor and the owner as well as the contractor and the sub-contractor. The responsibility for worker safety may be imposed on them based on the contracts. For example, a worker of a sub-contractor could possibly sue a general contractor based on a contract between the contractor and the owner that says that the contractor is not allowed to delegate the responsibility of workplace safety to the sub-contractor. 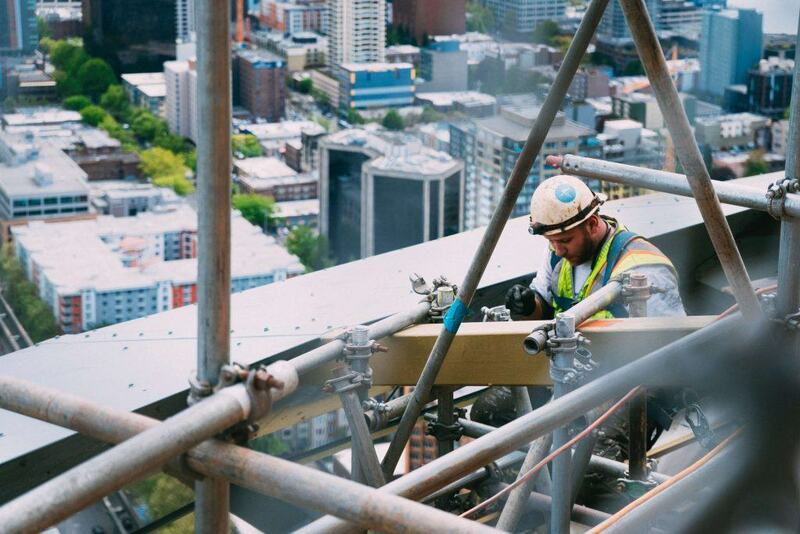 A plaintiff in a construction accident case can recover damages for medical expenses, estimated future medical expenses, loss of wages suffered, estimated future loss of wages, as well as past and future suffering and pain. The testimonies of doctors and other health care professionals will determine the medical expenses. An industry expert or an economist is often involved in determining the estimated future loss of wages. However, no experts can testify about the value of suffering and pain. The most important element in the plaintiff’s damages typically includes pain and suffering as well as emotional distress. There is no fixed formula for awards for pain and suffering, and it can widely vary from one case to another. The spouse of a plaintiff may also claim ‘loss of consortium’ damages. The spouse may recover damages to compensate for the loss of care, comfort, and other factors that occurs due to the injured spouse’s non-availability due to the construction injury and going through the experience of watching the plaintiff suffered. As per the law in California, if the plaintiff can establish that the wrongdoer’s conduct was malicious, fraudulent, or despicable they are entitled to punitive damages that are aimed at punishing the wrongdoer and setting an example for society in general. This could be setting new or additional legal precedent. Under California law, barring a few exceptions, a case of personal injury in construction accident must be initiated within a year from the date when the accident took place. In exceptional situations, such a time period may be extended to a year from the date when the injury and/or wrongdoing was discovered. However, it must be carefully noted that if a worker is filing a case against a public entity, they must bring the claim within six months from the date of the construction accident. Evaluation of settlements in construction accident cases is based on a wide range of factors. There are cases where no medical expenses or wage loss are presented, and yet the case settles for a very large amount, and there are cases where a large amount of money is gone into medical bills and loss of wages, but the case settles for a very small amount. For a review of the specifics in your case, contact an experienced Workers’ Compensation Attorney in Sacramento today. The attorney who handles a construction accident case should have a thorough familiarity with the latest laws as well as typical construction and contractor practices. It requires exquisite expertise to litigate a case of construction accident because of the complexities of the law and the number of variables that are sometimes involved. While representing an injured construction worker, a typical challenge is establishing that some person other than the employer was responsible (fully or at least partly) for the worker’s injury. This requires a close understanding of the operations of construction sites; the legal responsibilities of the site owner, contractor, and sub-contractors towards each other; on top of this, a thorough knowledge of laws related to a construction injury. In a construction injury case, an investigation will play a critical part and a plaintiff would usually need to consider the possibility of hiring an expert witness who could help bring focus to the investigation. Several types of experts can testify in a construction injury case. These may include a construction practices expert, safety expert, an expert in a specific trade, accident reconstruction expert, an economist, a human factor expert, and other damage experts. A construction accident case could involve delicate issues with regard to the relative responsibilities of different potential defendants to pay for the worker’s injury. These may include the construction site owner, the general contractor, as well as other independent sub-contractors. As per Proposition 51, it is the wrongdoer’s responsibility to pay 100 percent of the economic losses of the plaintiff, irrespective of the degree of fault, but in case of general damages, such as the damages related to pain, suffering and emotional distress, the responsibility is only up to the share of fault. Therefore, a construction accident attorney must be able to litigate the case in a way that increases the degree of fault of the non-employer defendant and maximizes the economic loss recovery for the plaintiff. A construction accident injury investigation should start before the finalization of the CAL/OSHA report, which could take months. Therefore, it is advisable for the injured worker’s attorney to perform whatever investigation is possible prior to the completion of the CAL/OSHA report. The plaintiff’s employer, co-workers, and insurer for the employer should generally be helpful in the investigation, particularly because the insurance company of the employer can potentially subrogate (receive back) a part of the benefits it paid the plaintiff from other parties responsible. Every general contractor, as well as sub-contractor at the site, will usually prepare an injury and investigation report. The plaintiff should make an effort to obtain copies of these reports during the course of litigation. In construction accident injury cases, the settlement can often be complex. This is because in any case where a workplace injury occurs there will be a case of workers’ compensation, and the interaction between the case of workers’ compensation and the case of personal injury against a third party defendant could become vital. In a construction injury case, the workers’ compensation insurance carrier usually intervenes or files a lien on the personal injury of the plaintiff, aiming to get back all the payments it made to the plaintiff from other defendants. If the plaintiff cannot ‘defeat’ the carrier’s claim, it will get its money back first from the verdict before the plaintiff has recovered anything. The plaintiff’s recovery could be significantly and seriously lower in such a situation. An attorney who is adept at handling a construction accident injury case will aim at obtaining a settlement where the employer’s insurance carrier waives (gives up) its lien or reduces it substantially. In the right case this can be done if the plaintiff is able to establish a considerable level of negligence on part of the employer, which could eliminate a lien; or there are considerable chances of the plaintiff losing, and the carrier is willing to reduce its lien to enable a settlement (as some reimbursement to the carrier would be better than nothing); or if the carrier is willing to waive or reduce its lien if it is excused by the plaintiff from paying any future benefits for medical and disability. A vital aspect of liens that is little understood by many plaintiffs and their attorneys is that unless a significant amount of negligence on part of the employer can be established, or the plaintiff’s attorney is able to negotiate a favorable ‘deal’ with the workers’ compensation carrier, the carrier will receive a credit of the plaintiff’s recovery amount through a settlement or a trial. In this case, “credit” implies that the insurance carrier will not have the responsibility to pay the plaintiff any future benefits until the plaintiff has utilized benefits equivalent to the net recovery amount of the plaintiff. I’m Ed Smith, a Sacramento Workers’ Compensation Attorney. When a person is injured on the job, the consequences can be devastating to both the individual and their family. If you or your loved ones need the assistance of an experienced attorney, please do not hesitate to call me at 916.921.6400for free and friendly advice. You can also find me online anytime on AutoAccident.com. I have severed the Sacramento region for over 35 years, assisting injured people and their families with personal injury and wrongful death claims. Browse through some of their reviews on Yelp, Google, and Avvo. The Million Dollar Forum is a professional association for injury lawyers who have won case verdicts and settlement awards worth in excess of $1 Million. You can review summaries of some of my past Verdicts and Settlements on my website, AutoAccident.com.